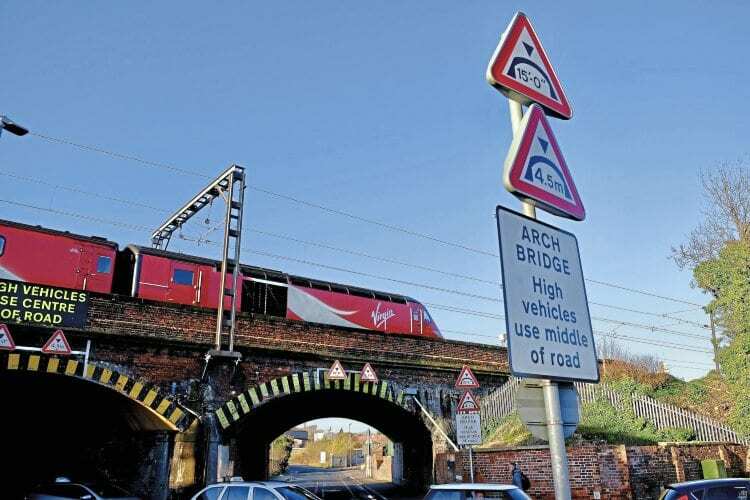 BRIDGE strikes, where over-height road vehicles collide with railway bridges, are costing UK taxpayers more than £23million a year in damages and delays, according to new industry figures. Network Rail reports the problem reaches its peak in October/November ,with around 10 incidents per day, but around 2,000 strikes every year affect hundreds of thousands of passengers through delays and cancellations. On average, each bridge strike costs the railway £13,500 and causes two hours of delays to train services. The financial cost of bridge bashes to Network Rail, train operators, local highways authorities, and haulage companies totalled £7.5m in the south- east of England alone last year. The most bashed bridge in Britain is Stuntney Road bridge in Ely, Cambridgeshire, which has been hit 113 times since 2009. Kenworthy Road bridge in Homerton, east London, comes a close second with 99 strikes in the last eight years, and a bridge on Thurlow Park Road in Tulse Hill, south London, has also been struck 92 times since 2009.